In case you hadn’t heard the good news, we recently announced our new grocery partner for University District—Save-On-Foods!We’re thrilled to be welcoming Save-On-Foods, and proud of their efforts to support our community and the movements they’ve made to support locally based initiatives in their neighbourhoods. 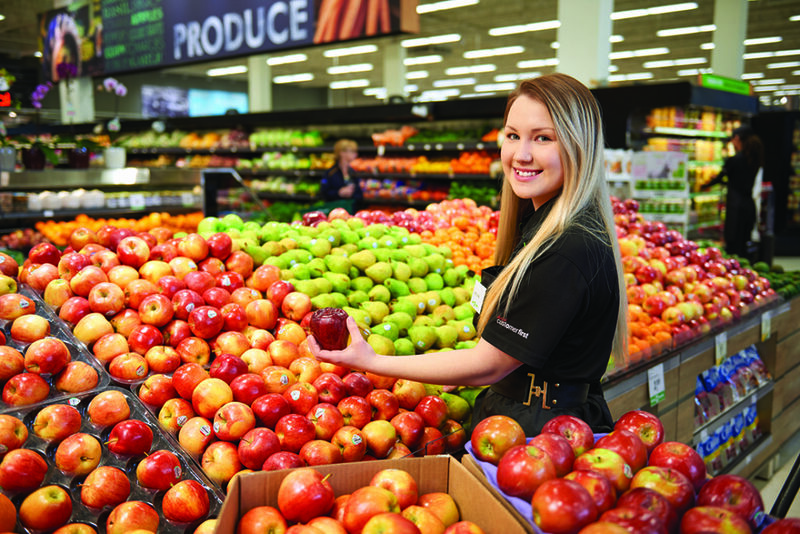 Beyond their community-centered activities, Save-On-Foods is also a champion of incorporating local products into their stores—making it a little easier for us to support our own communities in addition to eating seasonally. For a fresh take on grocery shopping wisdom, we spoke to Julie Dickson of Save-On-Foods on the best ways to make your trip to the store count. 1. What’s your ideal grocery-shopping strategy? Where do you recommend we begin and end in the store? At its core, efficient grocery shopping starts with having an idea of the meals you’d like to try over the week and plan what you’d like to pick up – especially if it’s not something you’d normally buy. I always recommend that shoppers stop by the flyer stand as you enter to check out for this week’s great deals and make sure to stock up on Darrell’s Deals as it’s always a must have-item at an unbelievable price. For easy, delicious meal ideas, start with the Fresh Solutions Centre in your store, you can pick up all the ingredients as well as a recipe card! As for where to start, I’d have to say produce to pick up your favourite fruits and vegetables, and take a look at what’s in season. If you don’t have any time to spare this week on meal prep, look for some of the salads, cut fruit and veggies as a great pick for something healthy and quick. After you hit the produce section, spend some time in the meat, seafood and deli departments – there’s tons of great options and made-fresh-in-store items like artisan sausages and ready-made sides. After that, stop by the bulk section for a wide selection of products including organics and spices. The best part about bulk is you get only what you want or need, and there’s less packaging, which is something we can all appreciate. Feeling a bit adventurous? Want to pick up something you’ve never bought before? Look for our What’s New stand so you can be among the first to try new products! 2. What’s your favourite Save-On grocery item? Why is it so great? That’s a tough question there are so many to choose from, but our favourites are some of our Western Family products (look for the black packaging). Western Family has been a trusted brand, feeding Western Canadian families for over 50 years, with affordable, healthy foods. With over 2,800 products, there’s something for all tastes and allows everybody to build quality meals. 3. What are some tips or tricks for picking the best food at the grocery store? What should buyers look for? Know what’s in season. Apples, squash and garlic are all at their best in the fall. Lemons and limes that feel ‘heavy’ for their size contain more juice. Choose firm, compact and bright green brussel sprouts. Trust your eyes and nose – if you associate mangoes with a strong, sweet smell, don’t be afraid to sniff out the best ones right there in the produce section! 4. How can we best minimize food waste from groceries? When you bring a new set of groceries home, move your older items from the back of the fridge and cupboards to the front. You could also try at-home composting— the City of Calgary has just rolled out a great program for this, or even donating food scraps to a local farm. Make one meal a week a ‘use-it-up’ meal where you incorporate leftovers or older food items instead of forgetting about them. Prep your weekday meals and snacks on the weekend so they are ready to grab and go, and package up any larger sized packaged items and freeze for future meals. 5. Any tips of tricks for repurposing food that’s not completely fresh anymore? Some of the best stocks are made from the scraps of vegetables—and they’re a great starting point for almost any soup or sauce! When you find yourself about to throw out the odds and ends cut from vegetables, instead bag them and put them in the freezer. They’ll be waiting for you the next time you realize you’ve run out of broth and need to make your own from scratch! 6. In your opinion, what sets Save-On-Foods apart from other grocers? I’d have to say great products at prices you’ll love, a commitment to providing innovative offerings, our reputation for community support, and supporting local. We always go the extra mile for our customers and our community! 7. Any exciting details or hints you can give us for what to expect at your University District location? Save-On-Foods is about building relationships with our communities and University District is no exception. We are excited to start customizing this location for the Northwest and to be a part of this unique, lively development! We’re more than a grocery retailer; we want to be considered as a community member and more importantly, a good neighbour. We pride ourselves on putting exactly the right offering for the community in every store we open and this 38,000 square foot location will be no different and we look forward to hearing from our new friends and neighbours in the coming months as we finalize the plans for this location. 8. What community-based programs and initiatives are Save-On-Foods involved with here in Calgary? We’re always trying our best to go above and beyond for our neighbours in all of cities and towns we serve. In addition to support for groups like I Can For Kids, we support food banks in all locations where we have stores, have been big supporters of Alberta Children’s Hospital for more than 2 decades, and support Breakfast Clubs of Canada through our participation in the Grocery Foundation’s annual Toonies for Tummies campaign. Just about every week you can find us supporting various fundraising efforts at our local store level that are important to our communities. What are you most excited to see at U/D’s Save-On-Foods? Let us know by joining the conversation on Twitter!